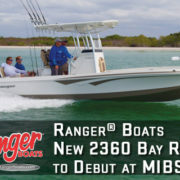 FLIPPIN, AR – Ranger® Boats‘ all-new 2360 Bay Ranger will debut at the 2017 Miami International Boat Show, Feb. 16-20, at Miami Marine Stadium Park and Basin on Virginia Key. The new offering is the latest from Ranger’s acclaimed Saltwater Series and provides a serious fishing rig with the attributes of style that Ranger is known for in its bay boats. 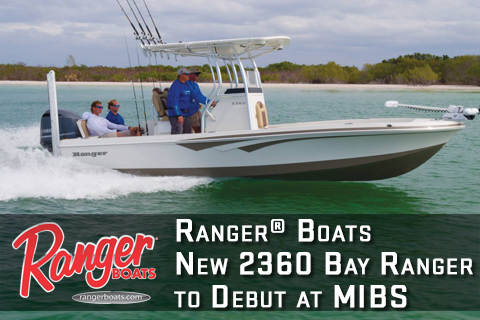 The all-new 2360 Bay Ranger is the continuation of Ranger’s legacy of producing premier recreational fishing boats. Measuring 23 feet, 5 inches, the 2360 is rated for up to a 300 horsepower outboard and houses an 81-gallon tank for long runs into big water. Equally at home in the shallows, the boat is able to draft in as little as 13 inches of water, giving anglers the confidence and stealth few other bay boats offer. A supremely versatile boat, the new 2360 also comes with the choice of a custom hard top or a factory-rigged second station tower. The design elements of the 2360 combine fishability with innovative style. Available in a multitude of color options, the boat’s Carolina flare design functions aesthetically while providing an ultra smooth, dry ride. Underwater L.E.D. lighting extends swim times, attracts bait and provides unique aesthetics while under power. The open design and center console layout provide 360 degrees of open area to work fish around the boat. The front deck has molded-in steps and an abundance of lockable storage with a port side rod box, drained starboard storage which doubles as a fish box and a forward anchor locker. The front deck also holds a 120-quart integrated fiberglass cooler while stand up rod holders are conveniently located on the console and along the gunnels. At the stern, two comfortable jump seats fold down to create a flush rear casting deck. The helm is designed to accommodate multiple large-screen electronics and houses a cluster of multi-function gauges for speed, rpm, fuel, trim and water pressure. The captain’s leaning post features premium upholstery and houses a lighted 40 gallon baitwell. The spacious center console includes an additional jump seat as well as walk-in access for an optional head. More standard features include Ranger’s legendary upright, level flotation standards, custom-fitted marine upholstery, integrated cup and tool holders, L.E.D. navigation lights, hydraulic jack plate, pultruded fiberglass transom, fiberglass stringer system, stainless steel tie cleats, console rail, and molded in trade dress. The all-new 2360 Bay Ranger comes paired with its own custom-built, tandem-axle Ranger Trail® trailer. Equipped with stainless steel fenders and built on-site to ensure the perfect fit, the Ranger Trail trailer includes an aluminum frame, torsion axle suspension, locking, swing-away tongue, LED lights, aluminum wheels, retractable tie downs, a patented center swing jack stand, and Ranger’s COOL Hub® lubrication system as standard equipment. Miami International Boat Show attendees can see the new 2360 Bay Ranger at Ranger Boats booth B205, as well as on-water demos on Pier 3. Approx. Boat Weight: 3,400 lbs.